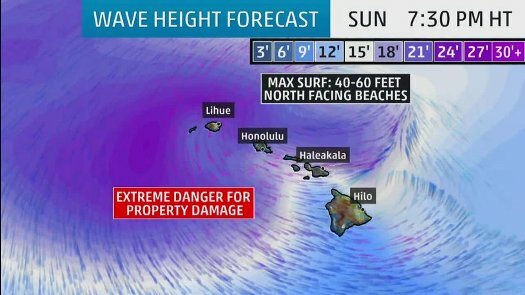 A winter storm reached Hawaii over the weekend, bringing dangerous surf conditions and damaging winds. Waves near Waimea Bay on the north shore of Oahu surpassed 60 feet Sunday afternoon, meteorologist Gavin Shigesato with the National Weather Service Honolulu Forecast Office told USA TODAY. Surf heights hit 45 feet on another part of the island, according to observation reports. Gusty winds, reaching a high of 53 mph in Oahu, knocked down trees and caused power outages throughout the islands, Shigesato said. About 26,870 customers throughout the state did not have power at 4 p.m. local time Sunday, according to Poweroutage.us. Debris on Sunday closed roads in downtown Honolulu and in the Waikiki area, Shigesato said. All state parks closed Sunday morning after the County of Hawaii closed beach parks on Saturday night, Hawaii County Mayor Harry Kim tweeted. The Honolulu Zoo closed before noon Sunday because of falling branches. Two African ground hornbills escaped from their enclosure, local station KITV reported, and officials asked the public not to approach the black birds “bigger than a chicken” with red skin under their beaks. Two evacuation centers opened Sunday morning on Oahu as officials told residents to monitor conditions. The Red Cross also opened a shelter in Kauai on Saturday night. Authorities said residents on the islands’ north shores should be prepared for coastal flooding. A 66-year-old California man died Friday after getting stuck in rough ocean conditions in Napili Bay, off northwest Maui. The weather service issued statewide high wind warnings as well as high surf warnings for life-threatening conditions at several shores until Monday morning. A storm warning ended Sunday afternoon. A gale warning was also in effect until Monday morning for surrounding waters and channels. The office forecast snow and ice on the Haleakala and Big Island summits through Sunday night, with visibility below a quarter-mile at times. The powerful, low-pressure storm north of the state, Shigesato said, also brought periods of downpours. AVO Cleveland YELLOW/ADVISORY - Unrest continues. No eruptive activity detected over the past week. AVO Veniaminof YELLOW/ADVISORY - No evidence of eruptive activity; very low-level seismic unrest continues.